If you’ve ever heard something along the lines of, “You know what, traffic really isn’t that bad in L.A…people move right along the 5 just fine, and the 101 only gets a tiny bit congested during rush hour,” then you know that whoever said this has either never driven before or is just plain ignorant about the city’s lacking infrastructure. To believe in something this untrue is more than just naive, it’s downright silly. Slow, stop-and-go traffic reigns king on our network of interstates, highways, and expressways (so much for “express”), and unless you can walk five minutes to work, you’re going to be forced to deal with it. Though our independent Porsche specialists are tucked away in Pasadena just northwest of the city, you better believe that we deal with congestion, too. So do our customers, who agree with our mantra that, if you’re going to be stuck in traffic, you may as well look good doing it. True, Porsches were designed with rapid acceleration and superior handling in mind, but they were also designed to look incredibly sharp. Whether you’re desperately searching “Porsche mechanic near me” after your clutch starts to die out or you’re looking for a reliable shop who can help you with aftermarket upgrades, always know that HOUSE Automotive is here to help. It’s true. Can people really soak in the details of your 911 Turbo when you’re flying by them on the interstate? No. But when you’re going 5-10mph in rolling traffic, you’re more likely to turn people’s eyes. Isn’t that half (or even most) of the point of owning a great-looking sports car? We think so. Tired of driving a stick shift in stop-and-go traffic? We’re sure that you are. Manual transmissions are incredible out on country roads, but every city slicker knows that you should drive an automatic when you’re in town. But hey, look on the bright side. At least your left calf is going to be totally jacked after months or years of going clutch in, clutch out. Your clutch itself will be totally “jacked”, too. BMW drivers may think that they’re the alpha drivers on the interstate, but there’s nothing cool about failing to use your turn signal. Take pride in knowing that you own the vehicle that other drivers actually envy. Is driving in stop-and-go traffic economical for your gas mileage? No, not at all. Cruising at a steady speed without stopping would net you far better fuel economy; that’s just common knowledge. But if you don’t have the opportunity to floor it and go all out with your throttle, then by definition, you’re getting better fuel economy when sitting in stop-and-go traffic. 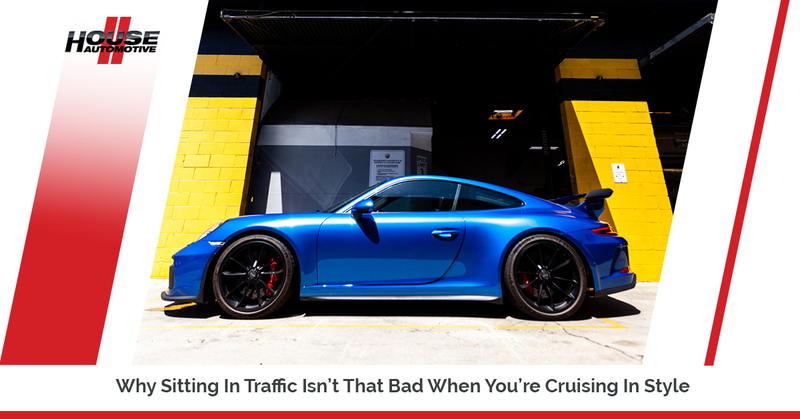 While you’re no doubt in the best-looking car on the road, all of that L.A. traffic is going to do a number on your Porsche. Make sure that you’re taking it to the true professionals here at HOUSE Automotive — schedule an appointment today! Looking For Other Ways To Take Care Of Your Porsche?